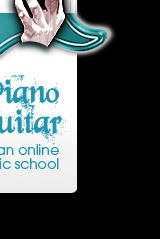 You will use PianoGuitar online Courses, products and services for your personal and private use only. Course and bonus product materials may not be duplicated or distributed in any way without expressed, written permission from Pianoguitar Adminitration. Pianoguitar may update course materials from time to time at its own discretion. Updates will be primarily fixes of software "bugs" and typographical errors but may also include additional course materials. Customers in good standing may use updates at no additional charge. Customers will receive Updates of the version of the course they purchased and will not be entitled to receive materials from other courses or UPGRADED versions of the course they purchased even if they are offered and sold on the same page. This includes UPGRADES to other modules of course materials. Pianoguitar retains all rights to these products. Pianoguitar wishes to provide you with an optimum personalized Internet experience. In order for you to take advantage of the many features of this website, you are first asked to complete a registration form. During registration, you will be requested to provide certain contact information, such as name and email address. This information is used to contact you about the services on our site for which you have expressed interest. Some of the information requested is optional and therefore not required. However, the more complete and accurate the information we are given, the better we are able to assist you in providing you with a superior and more personalized experience on our site. Pianoguitar is the sole owner of the information collected on this site. We will not sell, share, or rent this information to others in ways different from what is disclosed in this statement. 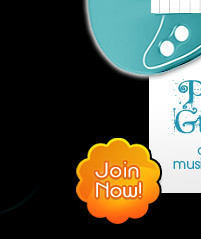 Pianoguitar collects information from our users at several different points on our website. We stress that all personal information is always treated as personal and confidential, unless specifically stated otherwise. We may share aggregated demographic information with our partners and advertisers. This is not linked to any personal information that can identify any individual person. We may partner with another party to provide specific services. When the user signs up for these services, we may share names, or other contact information that is necessary for the third party to provide these services. This web site contains links to other sites. Please be aware that Pianoguitar is not responsible for the privacy practices of such other sites. We encourage our users to be aware when they leave our site and to read the privacy statements of each and every web site that collects personally identifiable information. This privacy statement applies solely to information collected by this Web site. From time-to-time our site requests information from users via surveys or contests. Participation in these surveys or contests is completely voluntary and the user therefore has a choice whether or not to disclose this information. No user is obliged to disclose more information than is reasonably necessary to participate in a survey or contest. Information requested may include contact information and demographic information. Contact information will be used to notify the winners and award prizes. Survey information will be used in aggregate form for purposes of monitoring or improving the use and satisfaction of this site. This website takes certain precautions to protect our users' information. When you submit sensitive information via the website, your information is protected both online and off-line. However, there is unfortunately no way yet for the industry to guarantee that the information you transmit through the Internet is entirely secure. Users are responsible for securing the confidentiality of their password and account, and are fully responsible for all activities that occur under their password or account. It is strongly recommended that users take extra precautions when receiving files from unfamiliar third parties (i.e., via email), as they may be harmful. We may send all new members a welcoming email to verify password and username. Established members will occasionally receive information on products, services, special deals, and newsletters or other useful communications. Out of respect for the privacy of our users, we present the option to not receive these types of communications. Please see our choice and opt-out below. We may also send the user site and service announcement updates. Members are not able to un-subscribe from service announcements, which contain important information about the service. We communicate with the user to provide requested services and in regards to issues relating to their account via e-mail or phone. If your personally identifiable information changes, or if you no longer desire our service, we will endeavor to provide a way to correct, update or remove the personal data you provided to us. This can be done by sending us an e-mail. You are given the opportunity to 'opt-out' of having your information used for purposes not directly related to our site at the point where we ask for the information within our site. For example, a contest may include an 'opt-out' mechanism so users can participate in it without receiving any marketing material that may be connected to it. This website is not specifically directed at or intended for children. Our public forums, such as the chat rooms and message boards, are considered non-confidential communications. Much of the content in these public areas, including the content within specific messages, comments or postings is provided by and is the responsibility of the third party creator of the communication or the person posting the information. The Company does not control or endorse the content, messages or information found in any public forum and, therefore, the Company specifically disclaims any liability with regard to public forums and any actions resulting from a user's participation in any public forum. The Company has no responsibility for such content and is merely providing access to such content as a service to its users. The best way for you as a parent to protect your child's online privacy and safety is through supervision and parental guidance. Visit the sites that your child uses. Good communication with the child will help him/her be more aware of the risks involved in providing strangers with personal information, especially when using chat-rooms or e-mail. We strongly recommend that you supervise your children's activities when using these services as you would in any public area.